Gibassier is a French loaf which makes an excellent bread for breakfast, this bread is prepared with candied orange, orange blossom water and aniseed which is later topped with plain or vanilla sugar. Gibassier is baked during christmas season when orange is found abundantly, some old French stories says that earlier during xmas,orange is given as a gift from Santa to poor childrens. When you check for Xmas special French bakes most of the breads or cakes have this citrus fruit in it. Gibassier is also named as large cookie from Lourmarin as they looks like oval shaped leaves.Gibassier sounds as much as like Italian Panettone, and its believed that it must apparently be torn apart with the hands when served to bring good luck in the New year. 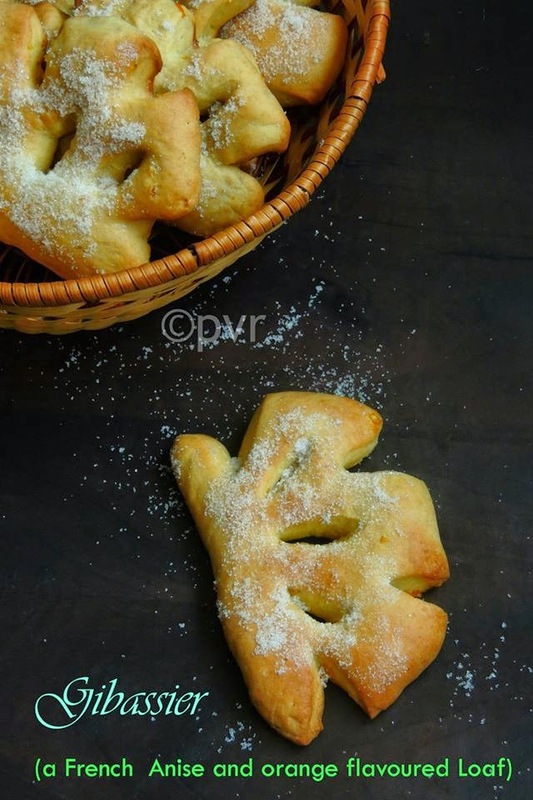 Gibassier is quite an easy bread but its bit time consuming, this bread goes for Biga or pre frement which is made before a day thats means the previous night if you plan to bake this bread. Biga gives an excellent texture and definitely its adds flavour to this already orange and aniseed flavoured bread.The orange blossom water gives a distinct flavour but still if you cant find them just skip it and replace it with freshly squeezed orange juice. 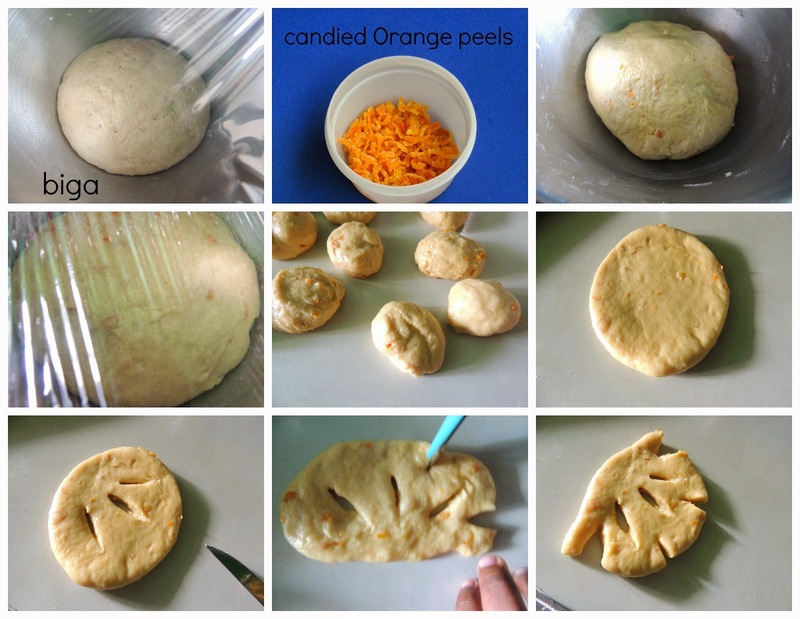 Also this bread goes for candied orange peels, if you arent able to get from stores, just make them at home. Totally this bread rocks and its one of my favourite breads i have baked so far. This bread is going to be part of this month's bread for We Knead To Bake, a monthly baking event by Aparna of My Diverse Kitchen. Previous night, mix all ingredients given for the pre-ferment into a stiff but smooth dough, cover it and keep in a room temperature for atleast 14-16hours. The dough would have risen and have a fermented look. 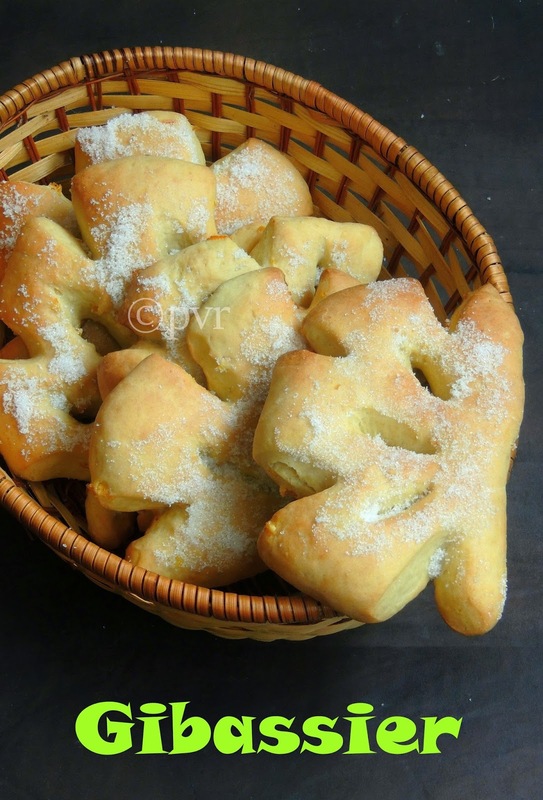 Next day, make the dough for gibassier, take the food processor or kitchen machine, add the eggs,olive oil, orange blossom water and run couple of times, add in the warm water or orange juice, mix. Now add the pre frement, (tear it as small chunks), bread flour,sugar, salt,yeast and knead everything as a smooth dough. Cut the butter as small chunks, add the butter to the dough and knead until the butter gets incorporated to the dough. Add the candied orange, aniseed, orange zest, knead well, transfer the dough to a greased bowl, cover it loosely and allow the dough to double the volume, let it sit for 2 hours. Punch down the dough and divide it as 12 equal portions, shape them as round and keep aside for 20minutes. Flatten them as oval or semi circle, make three cuts in the dough, one in the centre, two on each side of this cute from the straight edge. Now using the scissors, make 4snips along the arched side at equal distance. Lift the gibassier dough and transfer it to a baking sheet lined over a baking tray, repeat the same process with other balls. Let them rise for 30-45minutes till a little puffy. Bake them at 350F for about 15minutes or till they turns golden brown on the top. 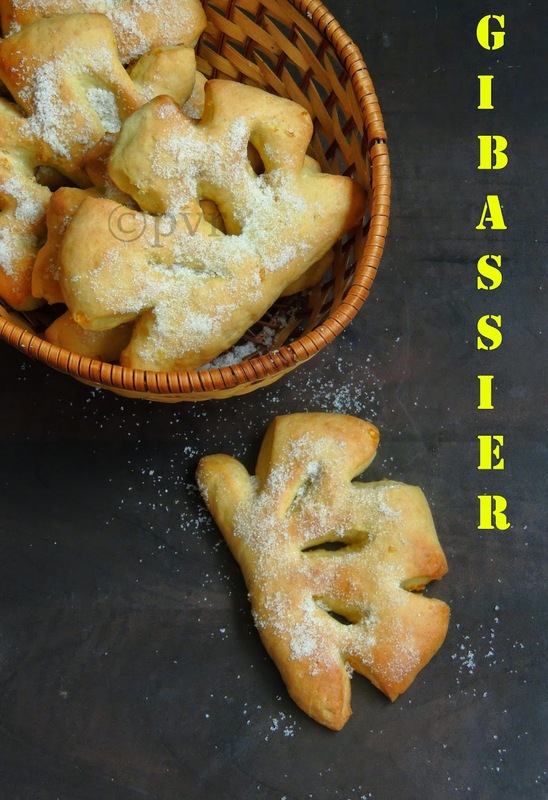 Take the gibassier from the oven, brush them with clarified butter while they were still hot,immediately press the brushed side down lightly into the vanilla sugar or castor sugar. Serve them with coffee or tea. The name itself sounds so exotic! Fantastic! Wish you were my neighbor!! wasn't it a delight baking these! You must have tasted these before in France? So soft and lovely looking loaves. Excellent preparation. You are a genius for sure. What an awesome dish. I wouldnt even try it.